Once confined to the biceps of sailors and bikers, tattoos are experiencing a serious surge in popularity in recent years. So how does the process work? Modern tattooing is done with an electrically-powered needle that looks – and sounds – a little like a dentist’s drill. But less terrifying. The needle punctures the skin at a rate of anywhere up to 3,000 times a minute, delivering a tiny drop of insoluble ink about a millimeter under the skin. This stuff is pretty damn accurate. 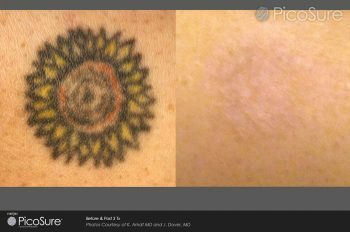 The actual tattoo itself is also created using several steps; it’s not a case of simply tracing a design with the needle. First, the tattoo artist will draw the outline. Done with a single-tipped needle and think ink, this process is usually started at the bottom right hand side (the left for lefties) so as not to smudge the all-important stencil while cleaning off excess ink. Wouldn’t want that cute puppy tattoo coming out looking like a Rottweiler. The shading is then done with a thicker ink and a whole bunch of needles – that way, you get a beautiful result with even, solid lines. Getting this bit wrong can also result in longer healing times and an increased ouch factor. Finally it’s time for a splash of colour, with lines overlapped to make sure there are no ‘holidays’ (that’s tattoo speak for areas where the artist missed a bit). And that’s it! A good wipe clean and a bandage and you’re good to go.